Repetitive Strain Injury (RSI, WRULD). - Sitting Safely? Repetitive Strain Injury (RSI, WRULD). Not only LBP but also Repetitive Strain Injury has to be taken into account in the design of chairs. 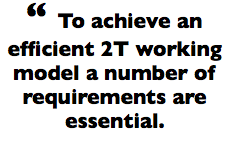 by Dr Henry Sanford, Consultant Orthopaedic Physician and CMO of OptEnCo. May 2003. You can be forgiven for ﬁnding this subject confusing. It is confusing because it’s a mess! There is no agreed terminology. There are diametrically opposed views on its nature and aetiology. Treatment is, at best, simplistic and at worst non existent. Although not life-threatening it is a condition that has the potential to wreck a career, curtail many activities and to give joy to lawyers. However, nil desperandum est, light is begining to show and divergent views are often the ﬁrst stage of a synthesis resulting in a breakthrough towards understanding. A history is helpful. The condition was described by Bernadino Ramazzini , the father of occupational medicine, in 1713 as “Scriveners Palsy”, Later it became commonly known as “Writers Cramp” related to “Shoemakers Cramp”, “Compositors Cramp”, “Semstresses Cramp”, “Milking Cramp” and “Musicians Cramp”. This group of condition were described by the neurologist Sir William Gowers in 1892 as an “occupational neurosis” of a “primary central nervous system ‘derangement’”. This implied a neurogenic origin – the concept of neurosis as a psychological entity came later, with Freud. The designation “RSI” was coined by Stone in 1983 denoting a “Repetitive Strain Injury” or “Repetition Strain Injury”. The Australian epidemic which peaked in 1984/5 resulted in increased public and medical awareness. A reaction to the large numbers and the ensuing litigation was that RSI was a condition characterised by “only one clinical criterion: namely, the complete absence of objective clinical signs of abnormality”1 and was iatrogenically determined. It was all the fault of the doctors who too readily diagnosed the condition. Hutson (1992) dryly commented that this theme was commonly expressed by other medical specialists “who may have been disadvantaged to the extent that they did not have a back-ground of expertise in musculo-skeletal medicine”. We will return to this later. The ﬁnal word in 1987 from Professor David Ferguson of the University of Sidney went further to describe the Australian epidemic as a “complex psychosocial phenomenon with elements of mass hysteria, which were superimposed on a basis of widespread discomfort, fatigue and morbidity”. This view was reinforced by Barton et al. in a report on behalf of the British Orthopaedic Association submitted to the Industrial Injuries Advisory Council in 1990. The view that there is no physical, organic basis to these conditions is held by many mainstream doctors to this day although the pendulum is again swinging away. RSI is now classiﬁed as Work Related Upper Limb Disorder (WRULD) although RSI is still the popular term and will probably remain so. After all, ‘Orthopaedics’ means ‘straight children’ although now not many in the speciality would regard the treatment of childhood scoliosis as their main concern. If RSI is to be considered, rightly in my opinion, as a spectrum of conditions then the near end consist of localised or referred primary musculo- skeletal pathology which can overlap and develop into the ‘primary central nervous system derangement’ postulated by Gowers over 50 years previously. Musculoskeletal Medicine, or Orthopaedic Medicine as he called it, was developed by Cyriax at St Thomas’ in the 1940/50s. His importance lies in his systematic functional examination of the motor and neural systems, using ranges of joint movement and isometrics of each muscle group to arrive at a precise anatomical localisation and hence effective treatment. A raft of conditions could be precisely identiﬁed such as tendinitis and tenosynovitis of the wrist tendons, de Quervain’s syndrome (long thumb tendons), and ligament sprains, disorders of tendon insertions (enthesopathies) including epicondylitis (lateral ‘tennis’ and medial ‘golfers’ elbow’), rotator cuff lesions and bursitis at the shoulder and the ‘Carpal tunnel syndrome’ at the wrist, to indicate but a few. Many were described for the ﬁrst time. An added complication is that pain and misleading tenderness can be referred down the arm from derangements of joints, ligaments and pressure on nerve roots and the dura mater in the neck. These conditions can be assigned to the WRULD Type I group. Accurate localisation and treatment should be prompt, and preferably by a doctor trained and experienced in Musculo-skeletal (orthopaedic) medicine. If the physical signs were inconsistent or contradictory and inappropriate and the symptoms exaggerated in distribution, behaviour or severity then Cyriax noticed that treatment was likely to be ineffective. Being inexplicable in anatomical terms he ascribed them to be of psychogenic origin . Active local treatment was found to be not only a waste of time but actually counter productive resulting in iatrogenic perpetuation and so he rightly referred these patients on to psychiatrists or pain clinics, then in their infancy. They are now in the WRULD TypeII group. The neural mechanisms are now better understood. The normal increase of pain at a localised tissue injury, due to inﬂammatory products, can sometimes cause exaggerated sensitivity of the peripheral nerve ﬁbres which is repeated up the spinal tracts to the brain. The excited state of certain brain centres, associated with excess production of brain neuro-transmitters, makes them vulnerable to the input from other parts of the brain, whether individual such as various psychological depressive or obsessional states or external social factors and stress. The resulting expression can be varied and include regional pain and ﬁbromyalgic syndromes and allied conditions such as Reﬂex Sympathetic Dystrophy, Abnormal Illness Behaviour and frank psychiatric illness. So, what are the practical implications for the management of RSI in the modern ofﬁce? The answer must be: Avoidance. • The height of the desk in relation to the height of the chair and the individual. It is taken for granted that the desk is variable height adjustable. That the wrists are supported in the straight neutral position. Slight wrist extension allows greater efﬁciency for ﬁnger ﬂexion but can create the conditions for a carpal tunnel syndrome. • The forearms ensuring that elbows are at a right angle or slightly extended. Elbow support allows relaxation of the shoulder girdle muscles. • The backrest of the chair as this will affect the posture of the neck. 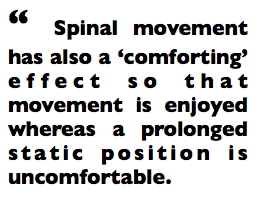 Ideally the backrest should incorporate iliac (pelvic) support as opposed to lumbar support. Sometimes it is possible to lower the lumbar support so that it supports the iliac crest. The seat of the chair should be tilted forward (down). Type II sufferers characteristically have a high neurotic index so that stress levels are likely to be of prime importance.. Of these background physiological stressors (noise, lighting, indoor air quality, humidity) found in the modern ofﬁce environment are the most signiﬁcant (Jukes) and easily corrected. Check stress levels. This assessment is simple and accurate. • Observe, discreetly, if there is any behaviour which might indicate pain on certain activities..
• Let it be known that work related symptoms should be reported immediately. • Do not pry. Overemphasis directs attention and can itself create a problem. • Check staff sickness rates including unreported 1/2 day absences to identify potential sufferers. If work is to be resumed an alternative method must be found if recurrence is to be avoided. • Institute all the measures, urgently, described under ‘avoidance’. • Alter workstation layout and tools so that activities are performed using muscle groups differently. • Reconsider practices. study from Leeds found that pain was related to the tasks with the highest estimated daily loads (Helliwell et al). 1 Awerbuch, M. (1986) RSI. Med. J. Aust., 145, 362-3. This entry was posted in OFFICE ENVIRONMENT on May 13, 2014 by Dr. Henry Sanford.